Please get in touch and we will try to reunite owners with items. Once again a glorious summer's day greeted 184 senior and 119 junior fell runners to Hutton Roof Crags 32nd Fell Race. The English Championships at Weets, dire weather warnings and bank holiday traffic warnings however, meant numbers were down on last year. The junior races included the International Mountain Running Youth Cup Trial for U18 athletes so there was a much larger entry than usual in the top junior age group and luckily the junior races completed in the dry. At the start of the senior race we remembered our marshal Pete (the sheriff) Bennell who sadly died of cancer not long after last years race. By 3pm the predicted heavy rain arrived with extreme winds and huge, sharp hail stones. The rain was so bad you couldn't see your feet. One runner suffered a particularly bad sprain and was helped off the course by two fellow runners in the best tradition of fell running. Many naturally relished the extreme challenge! Several marquees were damaged and the timing equipment failed temporarily so apologies for the missing race times. The 2017 winner was Danny Hope (Horwich) in 56:00, winning the Sheepskin Warehouse Trophy and a £50 Pete Bland voucher. In second place, last years winner, Adam Osborne (Leeds City) winning the Will Ramsbotham Memorial Trophy. 3rd was Andrew Payne (unattached) These were actually all V40 runners all coming in ahead of the younger competitors. Kirk Wadsworth (Helm Hill) took the V40 prize and Craig Roberts (Kendal) the V50. Thornton Taylor (Rossendale) took the V60 in 65:37 with Harry Bolton (Bowland) taking the V70 in 1:25:49. This year Bowland Fell Runners clinched the team prize (Steve Swarbrick, Sandy Lockett and Sam Harrison) beating Helm Hill into second place (Kirk Wadsworth,Craig Burrow and Paul MacFarlane). Hannah Bateson (Leeds) won the Ladies race in 1:07:09 receiving the Jenny Holt Trophy and £50 Pete Bland voucher, with Amie McAvoy (Garstang) in 1:12:04 second and Denise Wright ((Bingley) in third in 1:13:52. First Lady V40 was Amy Ball (C.O.L.T. ), 1:17:17, V50 Kate Ayres, Ambleside, 1:16:46. V60 winner was Dianne Priestley (Kendal) in 1:29:48. The Ladies' Team prize was taken by Ambleside (Kate Ayres, Cath Mussett and Kat Evans). The 119 junior runners competed in 6 age groups for boys and girls from age 6 to 18. 12 juniors from the parish competed this year, Carys Roberts (U9), wins the Hutton Roof Cup. U9 Boys: 1st Tom Ashworth(Ambleside), 2nd Ben Brassington (Settle Harriers), 3rd Issac Mitton (Settle Harriers). U11 Girls: 1st Bethan Saunders (Leven Valley), 2nd Sophie Cowin (Kendal) 3rd Taylor Gooding (Barlick). U13 Boys: 1st James Bowen (Ambleside), 2nd Harry Bowen (Ambleside), 3rd Ben Greenep (Settle Harriers). U13 Girls: 1st Martha Rigby (Settle Harriers), 2nd Maisie Evans (Ambleside), 3rd Lily Milner (Wharfedale Harriers). 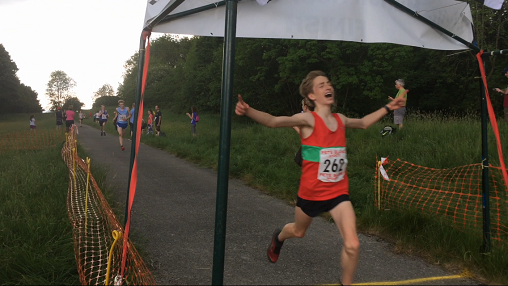 U15 Boys: 1st Henry Hunter (Helm Hill), 2nd Sonny Fitch (Settle Harriers), 3rd George Milner (Wharfedale Harriers). U15 Girls: 1st Alicia Newing (UA), 2nd Bethany Bergstrand (Middlesborough), 3rd Philippa Roden (UA). U17 Boys: 1st Sebastian Segger-Staveley (Settle Harriers), 2nd Matthew Knowles (Lancaster & Morecambe), 3rd Tim Clarkson Webb (RSSH). U17 Girls: 1st Rosie Woodhams (Dallam), 2nd Mia Easthope (Cumberland), 3rd Simone Rigby (Settle Harriers). U19 Girls: 1st Eve Crownshaw (Dark Peak), 2nd Bethan Moreley (Ilkley Harriers), 3rd Lily Higgins (Halesowen). Or order to collect at the fell race. Suitable for ‘novice’ and ‘expert’ fell runners alike. Flagged route so no major navigation problems other than finding the start!